First Lady Michelle Obama returns to Virginia this Friday for a two-part stop. The First Lady will headline campaign events in Charlottesville and Fredricksburg. 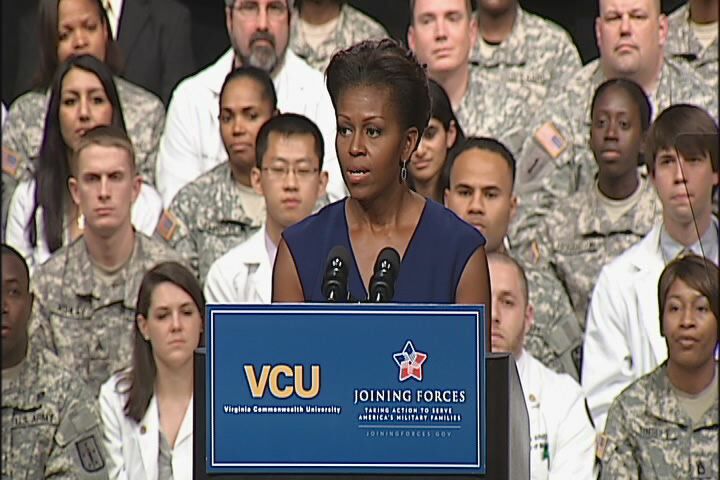 Mrs. Obama was in Richmond earlier this year for a White House event at VCU. She also worked in two fundraisers for Obama For America. She also made an official visit to Caroline County back in July of 2009. The First Lady, as many of her predecessors, actually has higher approval ratings than her husband and is known for drawing pretty big crowds herself. She has become a powerful spokesperson for woman’s rights, which is a key cog and in the Obama campaign re-election strategy. Her remarks on Friday are expected to center around the Obama administration’s successful passage the Lilly Ledbetter Fair Pay Act from 2009, a law the White House attempted to build upon this year unsuccessfully. In fact, Mrs. Obama’s visit to Charlottesville coincides with OFA’s “Women Vote 2012 Summit Tour” which is designed to highlight those issues. Both events are free and open to the public, but tickets are required because of limited space. These events are free and open to the public. Tickets are required due to limited space, and will be available to the public starting on a first come, first serve basis at the following Organizing for America pick-up locations below. Tickets will be available starting Wednesday at 11:00 AM EDT. As the crowd of roughly 900 people gathered at the Walkerton Tavern in Henrico, the air was thick and it was sunny and hot. That didn’t last too long. Shortly after the crowd took their spots to see Barack Obama, the rain began to fall and it stayed like that on and off until long after he was finished. It wasn’t the first time a candidate has ever given a passionate speech in the rain, it’s not even the first time Obama has, but the picture of a soaking wet president selling his message of fighting for the middle class provided his campaign excellent optics. While they couldn’t plan something like this, they took advantage of the situation and it served as a dramatic backdrop for the president to make the case that his tax plan is the best plan for America. GLEN ALLEN, VA (WWBT- For the seventh time since being elected president of the United States, President Barack Obama made a stop here in Central Virginia. 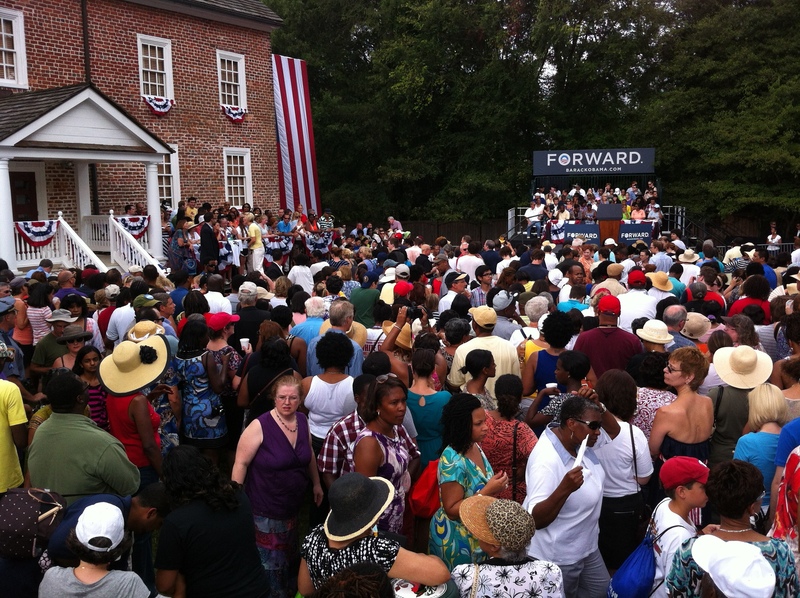 The president spoke to an outdoor crowd, in the middle of a rain storm at the Walkerton Tavern in Glen Allen. Through the pouring rain, which drenched everyone, including the leader of the free world, Barack Obama made a direct pitch to the middle class, and he used an issue that is normally strong with republicans, taxes. It came early, and stayed from almost the entire event, a soaking rain that was impossible to escape, even for the most powerful man on the planet. Obama, dressed in a shirt so wet that his undershirt was visible, didn’t seem to mind. He launched into a passionate defense of his plan to raise taxes on the wealthy, and cut them for the middle class. It was a message sent to Henrico voters, in one of the most important swing counties in America. Tracey Snyderman is one of the voters, and agrees. But the president didn’t convince everyone. Matt Walton is a teacher and a Romney supporter. He came to hear the president speak, but is not convinced that higher taxes of any kind will help. It will be an outdoor setting this afternoon for President Barack Obama‘s visit to Glen Allen. 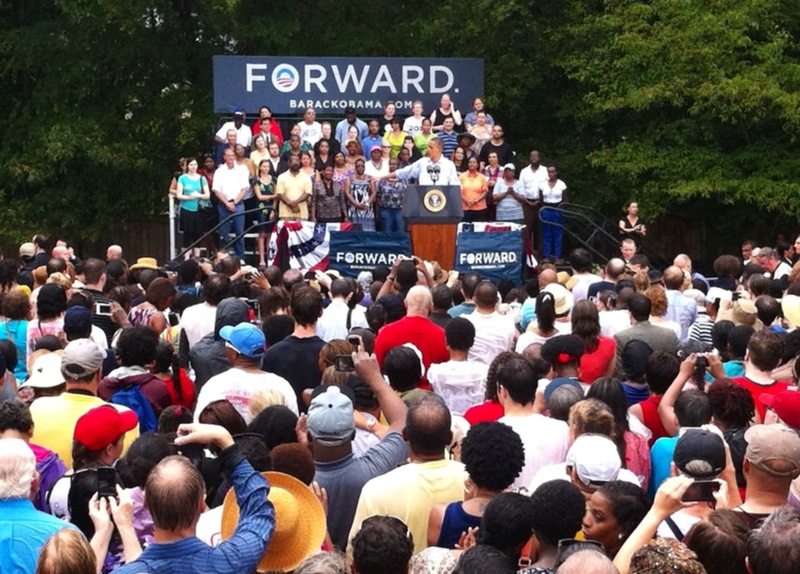 Obama is in the midst of a two day five stop swing through the Commonwealth in support of his re-election campaign. The president spent time in Virginia Beach, Roanoke and Hampton yesterday. The theme of this swing is to speak directly to middle class voters in Virginia. Obama is expected to tout his tax plan which calls for a sunset of the Bush Tax Cuts for people making more than $250,000 a year, and extending th cuts for everyone else under that mark. In front of a banner that reads “Forward” (which you and kind of make out in that picture) the president will remind the supportive crowd of the work he has done already on tax relief. Work he estimates at saving middle class Americans billions of dollars. Republicans in Richmond yesterday, argued that the Obama tax plan amounts to class warfare. Mayor Rudy Giuliani said yesterday that Obama is working to pit the rich against the poor and at the same time punishing job creators. Lt. Governor Bill Bolling is on board the Mitt Romney campaign bus this morning to offer a counter argument to the Obama visit. The bus has been making laps around the area in front of Walkerton Tavern all morning. We will provide live coverage of the preisdent’s visit today on air and on line. 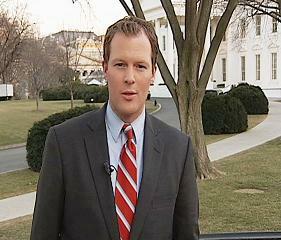 We will cut in on TV when the president lands at Richmond International Airport and when he arrives here in Glen Allen. The entire event can be seen without interruption on our web site, NBC12.com. Detour signs will be utilized to assist motorists with identifying alternate routes. Residents who live inside the road closure areas will be allowed access to and from their homes by the Police Officers who will be posted at the road closure points. Motorists attending the NATIONAL SOFTBALL TOURNAMENT at R. F. & P. Park should utilize Staples Mill Road to access Mountain Road in order to travel to R. F. & P. Park. Motorists attending the AMATEUR SOFTBALL ASSOCIATION TOURNAMENT at the Glen Allen Sports Complex should use Brook Road to Mountain Road to access the sports complex. More than 100 Henrico County Police Officers will be on duty for the specific purpose of assisting with traffic and security for this event. They will be posted at road closure points to provide direction and assistance to motorists. The Henrico Police Division will staff a Traffic & Event Help Telephone Line from 8:00 a.m. to 4:00 p.m. on Saturday to provide residents with traffic information associated with the event. The number to call for assistance, if needed, is 804-501-4838. Additional information, including detour routes, will be posted on the Henrico County Police Web Page (www.henricopolice.org). Mayor Rudy Giuliani is one of the most effective surrogates for Republicans across the country and it is not a surprise. He is not afraid to attack from the stump. Interestingly, Giulani who is often accused of using 9/11 as a cruch to prop up his political career, never onced mentioned the attacks, or his role in the aftermath. This despite touting his accomplishments fighting crime and reforming welfare. 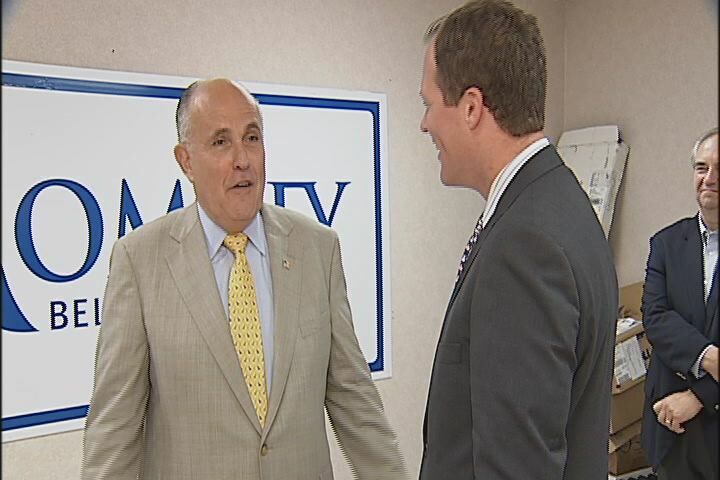 I spoke to the man dubbed “America’s Mayor” after the speech. Our complete interview can be found below. The Obama campaign is set to drop an ad in Virginia that contrasts the newly proposed tax plan by the White House against Mitt Romney‘s proposed plan. The new ad is said to be a preview of the theme of the upcoming visit by the campaign to Virginia this weekend. The ad will air in nine battleground states including Virginia. OFA has also launched a companion web site to provide a degree of context. “Mitt Romney wants to extend the Bush tax cuts for the wealthy,” reads the web site. “And add his own tax breaks for millionaires on top of it—without saying how he’d pay for it. Priebus said that Obama doesn’t even have the support of senate candidate Tim Kaine on extending the Bush tax cuts to people making $250 thousand and less and then allowing them to sunset on high earners. He said a plan like that would hammer “800 thousand” small business owners. Just in from the Obama campaign: Plans are being made for President Barack Obama to hold a small campaign event in Glen Allen on Saturday. The president will headline what a campaign official calls a “small grass root event” at the Walkerton Tavern Gardens on Mountain Road. This is the third announced visit by the Obama campaign on a two day swing through the Commonwealth. The president will also visit Roanoke and Virginia Beach. The campaign will reveal ticket information and the specific time of the event later today. The event is free and open to the public, but tickets are required for entrance. One ticket per person will be distributed on a first-come, first-served basis.